MyFax® is an award-winning Internet fax service that lets you send and receive faxes through your email, the web, or smart phone. MyFax provides exceptional value, a great low monthly price, and 24/7 customer support. Lots of features! One year of free online storage, fax from 5 email addresses, add cover pages, fax from Microsoft© Office, free apps for iPhone® and BlackBerry®, and more. MyFax requires no hardware or software. All you need is Internet access, an email address, and a MyFax account. MyFax goes where you go. Your MyFax number is tied to your email, so you can fax from home, work, and while traveling - anywhere you access the Internet. MyFax eliminates the need for a fax machine, fax supplies (paper, ink, toner), a separate phone line for faxing, and costly maintenance. It saves you money. Choose your plan, pick your number, and you're done! Your fax number is ready to use as soon as you order. If you use or have used MyFax in the past, please share this page using the buttons above and be sure to leave a rating and review of the service so other people can make an informed buying choice based on your experiences! It's free and you are not required to register! If you have experience with MyFax, we kindly ask that you please share your thoughts with others on this website by submitting an honest, detailed review. Your feedback will help prospective clients decide which service provider to choose and is incredibly valuable to the community itself as well as MyFax's representatives that read this website. Please do not use this form for support inquiries. Be aware that these reviews may also be syndicated and displayed on MyFax's website, and as such a strict review policy is in effect. All reviews are moderated prior to being published, and reviews that do not contain concise, detailed comments or do not support their associated ratings will not be published. We urge you to be as detailed as possible when leaving feedback, as MyFax may also use this information as feedback for their business and are themselves encouraged to reply to reviews posted to their listings. You pay to receive junk faxes. They refuse to do anything about junk faxes you receive, quietky changing the terms of service a year ago (junk faxes used to be non-chargeable). They are now owned by J2, the same awful company that runs the other bad fax service, and guess what... eFax is the same horrible company too. Avoid these people and their disgusting tactics. After 3 contacts with their customer service I was told that they won't help at all with junk faxes and to contact the senders. Here's the interesting part, their advertising states they actively work to protect you from junk faxes, when i asked how exactly they do this I was told, actually, they don't. They "used to" now they just charge you for junk faxes. Like i said, this company is complete garbage. Horrible customer service!!! For days I was and still am trying to get them to cancel my account. They opened up TWO accounts for me so I was unaware of one that was open and they refused to refund a single penny; reason being "because of our policy we are unable to give you a refund". Ridiculous. I even sent them emails asking to cancel it multiple times and they still try to say that I never tried to contact them about a cancellation. If you need to fax something, do not use MyFax!! You can usually fax things for cheap at your local library or if you have a university near you (usually just a couple of dollars). Wish I'd read some of these reviews before we purchases. Definitely "Buyer Beware", they lure you in with the low monthly fees but don't tell you that the way they make their money is based on how long a fax might take to go through, not the number of pages you send. So if you're fax takes 60 seconds to transmit - for whatever reason - you will be charged for multiple pages. They make it almost impossible to gauge what your monthly charge will be in any given billing cycle. We called several times to get a handle on the charges, we upgraded, we downgraded and then finally, this last time we called someone explained the multiple page billing based on transmission time. That might have been good information to have in the beginning. Seems like they held out telling us that as long as possible. Needless to say, we don't like uncertainties when it comes to our monthly business expenses, so we canceled today to be effective immediately. Now after reading some of these reviews, I'm worried about our cancellation going through smoothly. I went into the account - which is still active, by the way - and there is no option to cancel the account online. How is that possible? I requested a live chat - still nothing. I'm prepared to go to the mat on this one, I'm furious! Stay away from this company. Poor business practices. If this is standard operating for this industry, then the old fashioned way suits me just fine. After you sign up for their free trial they try to do everything they can to make you pay the monthly fee. Even after you cancel your service, they claim that they have no record and charge you. Their customer support is very poor and repeat the typical "it's in the fine print, there is nothing we can do if we don't have anything on record." Pretty much, they can claim whatever they want and it's their word versus yours. Stay away from the service. They have gone from a wonderful service to a shame bunch of bandits. I am currently embroiled with trying to get a credit for an annual renewal that they charged to my credit card after I removed my fax number from them and cancelled service. Actually, without a fax number they are unable to embarrass me with my clients. Don't even think about using Myfax. It used to be a good company. I think it was bought by eFax. Now it's horrible. They are competing with eFax which will be worse than the other. I would not go with this company if they were the last fax compnay left on the planet. But guess what, thankfully they are not. Very poor customer service. They make-up the pricing rules as they go. They want to charge 4G service rates for fax. I only receive faxes...and less than 30 pages per month. They also make it impossible to transfer your number - forcing me to change my fax number. I've been dealing with MyFax for a week now. I can send faxes but can't received them. They escalated the problem, but never responded. Apparently they say the phone number doesn't work and aren't offering an explanation or fix. They won't refund the money for something that doesn't work. I'm giving them a day, calling again, and then I'm filing a credit card complaint and contacting my lawyer service. Pretty good scam and/or flat poor service. Don't use MyFax. They claim they keep 12 months of faxes online but my account can't retrieve message older than 3 months. After several calls to support they say they cannot retireve my messages and they don't know why it happened. I said if it's a glitch why does it keep dropping 3 month old messages. They couldn't tell me. I asked to upgrade to a level of service that has longer retention. They said they don't have that capability. I tried to port my number to eFax but MyFax ownes the number and they won't release it. I hgihly recommend you don't use EFax. Why did the best fax service turn into doo-doo? They just do not give a cap! My Fax is very easy to use and failry affordable. However after my free trial, they began charging me earlier and earlier each month! When I called the third day of the month, my premium had been paid on day 1, I was advised my cancellation would be effective immediately. I tried to explain I had just paid for the month. The representative advised me I could get a refund request form. I calmly explained that I wanted to continue to use the service I had just paid for that month but didn't want future charges. She said I could cancel immediately or get a refund. When I asked to speak to a supervisor she told me, "She will just tell you the same thing." When I asked a second time to speak to a supervisor, she said I would have a very long hold time and she didn't advise that........!!!! WHAT? Are you kidding me. This is some of the worst customer service I have ever had. I would gladly pay more for a friendly and HELPFUL service. I have the standard package for $10 which allows me to send 100 faxes per month. I got a bill for $13.70 and inquired as to the overage. I was told that I sent 49 pages, and was billed for 137 pages (they call this the adjusted # of pages) because some of them took longer to go through. They DO NOT bill by actual # of pages sent. The service was fine, the advertising is fraudulent. This company makes it difficult to get out of the contract. Too many rules! Tried to get out the contract 3 months ago and apparently I didn't do something right, because they billed me for the 3 months. To bad for me their payment was automatic. I will never use them again and will also make sure whom ever I talk to about email fax to beware of the automatic billing contract. Very unreliable for inbound fax delivery. Have many in my sales force that can't fax in. Have tried multiple fax machines, phone lines, etc. The platform seems to have changed within the last year or so and now I find it to be unreliable. I was referred to myfax from a client who had no issues, in the past year thay have gone down 3 times. for the past week I was receiving faxes however sent faxes never arrived. Three strikes and I am out. MyFax Lost our ATT Fax Number! We decided to transfer/port our ATT fax line to become more virtual, greener, etc. All I needed to do was port our fax number which I have done with other businesses with no issues. This process took many weeks and many phone calls. The first time I called in I got the sense that they had lost my request and didn't even know about it. The last phone call I made today was because customers were calling to tell us that they could not fax, they just got a message "This number is not in use". Again I called support they could not explain what went wrong, nor could they even give me an ETA to fix it. Also the interface is not user friendly it's hard to navigate and finding/confirming sent faxes is a 4 levels deep. Bottom line, I would only sign up for this service for home use, not business use. I have had 2 hellish experiences with MyFax such that I have stopped using it to fax. 2 times I faxed to 2 different customers in the evening. I got panic phone calls from the customers in the morning because in the first case, the document came through 800 times! The 2nd time, the document went through 1800 times! This is not, I repeat, not good for business. Customers do not like to waste reams and reams of paper! Customer support said that the fax got corrupted somewhere along the line. huh???? While customer support remains active, they can't do anything to fix an awful product. 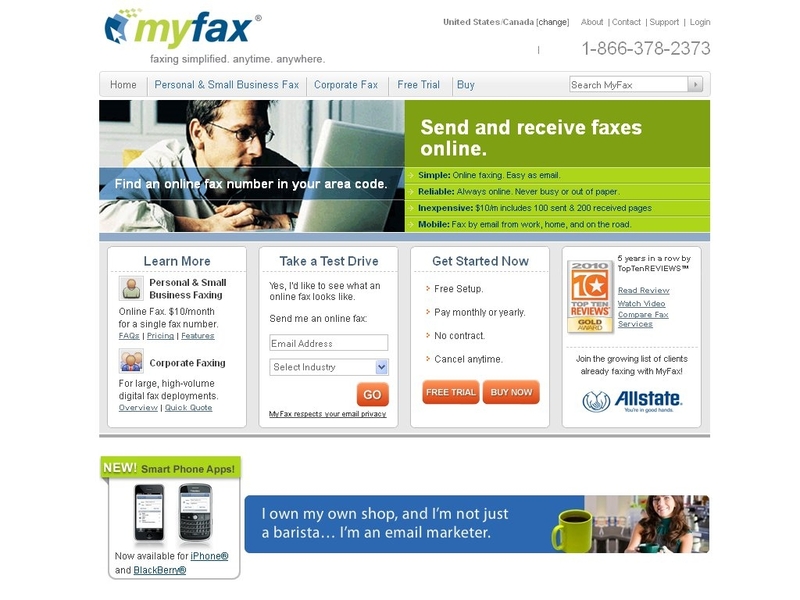 Have used myfax since 2006 at which time it was a good product and worked as advertised. Recently, I have been unable to get a fax sent through their service, and have had to use alternate providers. I do not recommend !